ATTENTION: many of the local stamps of the United States are reprints! 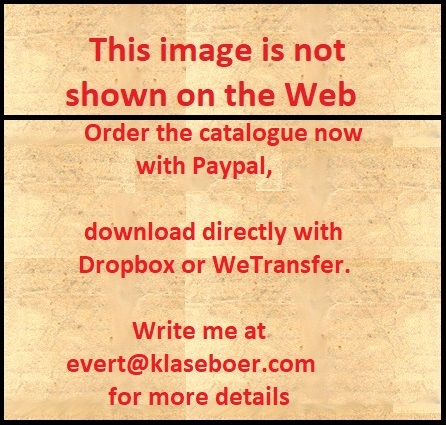 This local stamp was issued in 1885 in the colour black on red. Note the special cancel on these stamps. The genuine stamps have the colour blue, brown or green. They were issued in 1860 in Chicago. At least the following colours of the above forgery exist: blue, black, red, brown, green, grey and black on blue. This stamp was issued in 1847 in New York. The colour of this stamp should be black on green. 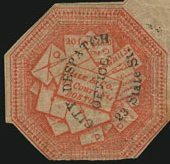 A forgery of the stamp of the 1847 Franklin City Despatch Post issue is shown above. These were produced by the "Prince of Forgers" S. Allan Taylor in the 1860's. They don't resemble at all the genuine stamps and can be considered totally bogus. I have also seen 2 c black on blue and 2 c red in the same design. There seems to exist a very rare circular stamp with inscription 'FRAZER & CO' issued in 1845, however I have never seen any picture of it. Another set of stamps with a man riding a horse exist in the colours black on red, black on blue and black on yellow (all 2 c), sorry, no pictures available at this moment. Only this blue stamp was issued (around 1855, New York). There are three different designs for the G&H local post: 1) inscription 'CITY DELIVERY G&H SAN FRANCISCO' with '5' in every corner. 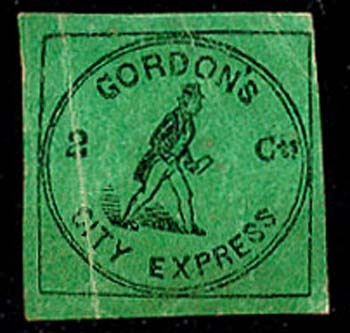 2) inscription 'CITY EXPRESS G&H PAID 123 Washington St. S.E. Cor Sansome (sorry, no picture available yet) and 3) inscription 'CITY EXPRESS G&H - PAID S.E. corner Washington and Sansome Sts.'. The last stamp exists with a cross on 'H' of 'G&H' (see picture above). Note the very strange border of this stamp. I have also seen this forgery in the colour black on green. Two stamps were issued: a black on green one and a black on red one. The black on red stamp is very rare (only 4 copies known with 3 still on the cover). I have seen the above forgeries in the colours black, brown, red, black on violet and black on green. Only one stamp was issued in 1856 in the colour black. 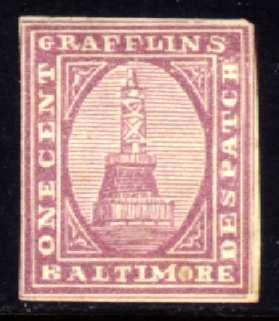 In the genuine stamps there should be traces of a horizontal line through the upper side of the letter of the word 'BALTIMORE'. I've been told that the above forgeries were made by Allan Taylor. I've seen the colours black, red, brown, green and violet of these Taylor forgeries. Of course, any colour other than black is bogus. Issued in 1898. This could be a bogus issue. Guy's City Despatch, Philadelphia, issued stamps in 1879 (two values in the colours red or blue). These stamps are relatively common. 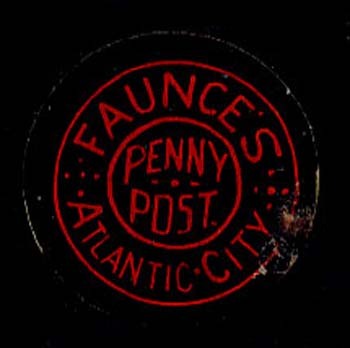 A stamp in a circular design with inscription 'H&B PENNY POST ATLANTIC CITY' was issued in 1886 in the colour black on red (sorry, no picture available yet). This stamp was initially issued in blue and red in 1844 with inscription '13 Court St.'. Due to change in adress some overprints with 'CITY DESPATCH OFFICE 23 STATE St.' exist (both blue and red). Later the adress was completely omitted (only the blue stamps exist in this state). I have also seen stamps with the adress changed manually. Only one stamp was issued by the 'Hall & Mills' Despatch Post' in 1847; the colour is black on green.